“Total shoulder replacement surgery alleviates pain by replacing the damaged bone and cartilage with a metal and plastic implant. The shoulder joint is a ball and socket joint, much like the hip joint. The ball is the top of the arm bone (the humerus), and the socket is within the shoulder blade (scapula). This joint allows people an enormous range of motion at the shoulder. 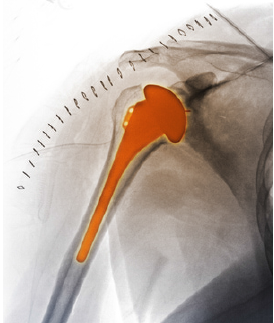 When shoulder replacement surgery is performed, the ball is removed from the top of the humerus and replaced with a metal implant. This is shaped like a half-moon and attached to a stem inserted down the centre of the arm bone. The socket portion of the joint is shaved clean and replaced with a plastic socket that is cemented into the shoulder blade. Shoulder replacement surgery lasts about two hours. The incision for the surgery is along the front of the shoulder joint and usually about four to six inches long. The surgery is most commonly done under general anaesthesia”. So, I hear you ask, why the hell do you want to stay awake? Well like I said in the introduction, it’s been so long since I’ve been without pain I want to be awake to experience it! In addition, it means a quicker recovery time and with all the other medical conditions I have going on, it’s probably the safest route to take – or maybe it’s just morbid curiosity.